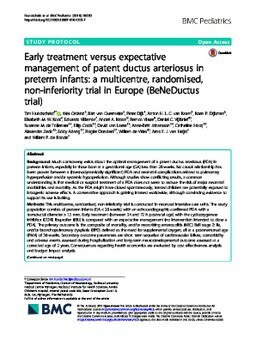 Background: Much controversy exists about the optimal management of a patent ductus arteriosus (PDA) in preterm infants, especially in those born at a gestational age (GA) less than 28weeks. No causal relationship has been proven between a (haemodynamically significant) PDA and neonatal complications related to pulmonary hyperperfusion and/or systemic hypoperfusion. Although studies show conflicting results, a common understanding is that medical or surgical treatment of a PDA does not seem to reduce the risk of major neonatal morbidities and mortality. As the PDA might have closed spontaneously, treated children are potentially exposed to iatrogenic adverse effects. A conservative approach is gaining interest worldwide, although convincing evidence to support its use is lacking. Methods: This multicentre, randomised, non-inferiority trial is conducted in neonatal intensive care units. The study population consists of preterm infants (GA<28weeks) with an echocardiographic-confirmed PDA with a transductal diameter>1.5mm. Early treatment (between 24 and 72h postnatal age) with the cyclooxygenase inhibitor(COXi) ibuprofen (IBU) is compared with an expectative management (no intervention intended to close a PDA). The primary outcome is the composite of mortality, and/or necrotising enterocolitis (NEC) Bell stage ≥ IIa, and/or bronchopulmonary dysplasia (BPD) defined as the need for supplemental oxygen, all at a postmenstrual age (PMA) of 36weeks. Secondary outcome parameters are short term sequelae of cardiovascular failure, comorbidity and adverse events assessed during hospitalization and long-term neurodevelopmental outcome assessed at a corrected age of 2 years. Consequences regarding health economics are evaluated by cost effectiveness analysis and budget impact analysis. Discussion: As a conservative approach is gaining interest, we investigate whether in preterm infants, born at a GA less than 28weeks, with a PDA an expectative management is non-inferior to early treatment with IBU regarding to the composite outcome of mortality and/or NEC and/or BPD at a PMA of 36weeks.